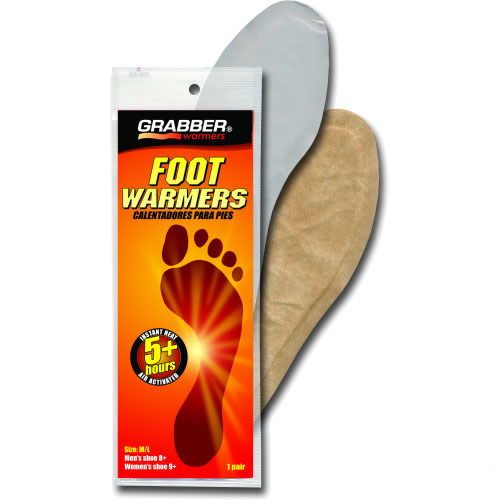 GRABBER Foot Warmers are thin, comfortable air-activated Warmers that fit in your shoe or boot, and provide over 5 hours of soothing warmth beneath your feet. The latest addition to the best-selling line of Grabber Warmers®, Foot Warmers contain a revolutionary air-activated warmer technology. Each individual package contains 2 Warmers. GRABBER Foot Warmers are a non-toxic, environmentally friendly, odorless heat source using all natural ingredients that are non-combustible. Pack contains 30 Pairs. S/M: Fits Women Shoe Size 5-8, Mens Shoe Size 4-7 - . M/L: Fits Women Shoe Size 9+, Mens Shoe Size 8+ . Temperature: Avg. temp. 95˚F (35˚C), max. temp. 102˚F (39˚C) when used as directed. HEAT RELIEF DEPOT GUARANTEES YOU FRESH STOCK WITH LONG EXPIRATION DATES! Click here to view more Grabber Warmer Products.